Four healthcare professionals have been arrested on suspicion of administering poison or a noxious substance to patients at a hospital. 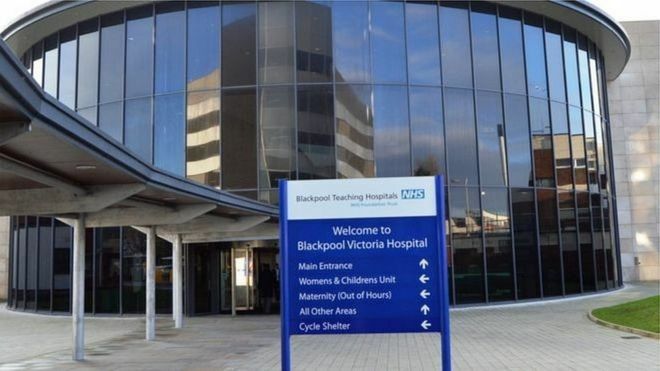 One man and three women have been held amid allegations of mistreatment and neglect at Blackpool Victoria Hospital. Police are investigating after concerns were raised about the care provided to some patients on the stroke unit. Two women and a man previously arrested as part of the inquiry were released under investigation. The seven suspects, who are all healthcare professionals, have been suspended as part of safeguarding procedures while investigations continue. The stroke unit is at the centre of a separate murder investigation following the death of 75-year-old Valerie Kneale there in November. A post-mortem examination after Ms Kneale's death found an injury which police said was believed to be suspicious. Det Ch Insp Jill Johnston said while she "understands further arrests could be concerning", she would like to reassure the public that the force has a "dedicated team of detectives working on this investigation". Wendy Swift, chief executive at the hospital trust, said "the provision of services will continue as usual" while "the hospital remains a safe and caring environment for patients". She added: "We take all allegations of this type extremely seriously and when the concerns were raised last year about the individuals they were immediately suspended."